I would like to thank Rhavas of Interstellar Privateer for his contributions. 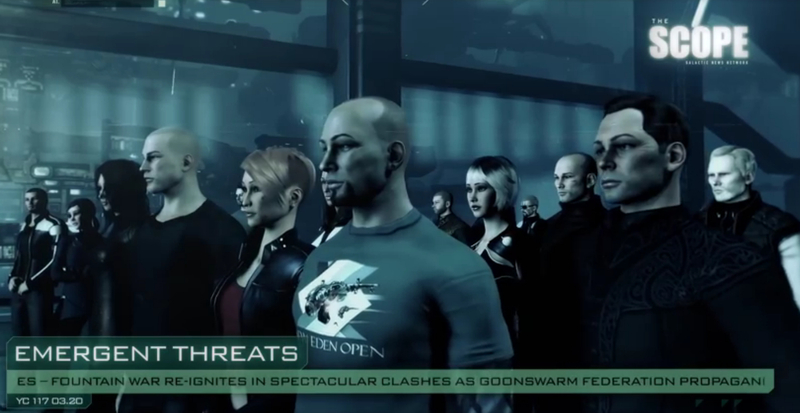 Following a long established Fanfest custom, CCP presented a new cinematic trailer. While it looks great, a lot of what is happening there could appear confusing to players who have not paid close attention to the recent backstory developments. To help with that, I want to provide an explanation of the scenes in the trailer. For those who already follow the developments in New Eden’s background narrative, this article will provide material for further speculation, based on my own theories and those of others. The trailer begins with voiceovers and scenes about an anomaly—a supernova in fact—which exploded in the remote and secluded Jove Empire. It was first spotted by the player and space explorer Caroline Grace and hence received the name Caroline’s Star; albeit by now it has become Caroline’s Nebula. Others have then triangulated the location of the stellar explosion and established that it did indeed occur in Jove space. The next few seconds of voice-over comment on the closing of all Jove stargates, the appearance of strange unidentified listening posts and the Circadian Seeker drones. About 55 seconds into the trailer we get the first revelation of something new: a listening post that has been damaged and Circadian Seekers which are scanning or salvaging from the resulting breach. Since the Scylla expansion we can actually see that damage on the structures, now called the Jove Observatory. It has since been confirmed that the Drifter Battleships are the ones causing those ruptures. In the next few seconds of trailer, it is implied that the Circadian Seekers bring whatever they collect back into wormhole space, and then we see a few things which are quite significant. The Circadian Seekers are now approaching a Sleeper ruin and in the background—floating above the destroyed Sleeper enclave—a gigantic ship or structure of a kind that was never encountered before is visible. We then witness how Circadian Seekers collect corpses from the Sleeper ruins. They are brought somewhere (very likely that giant structure) to be transformed and revived as Drifters. This carries a number or striking implications supported by voiceovers which I will return to later. The next cut shows us the interior of a hangar where two male Drifters observe the launching of Drifter battleships. The architecture of that hangar looks very similar to the design of the Jove Observatories. Personally, I do not think it is the actual interior of such a structure though. Why would the Drifters dismantle those if they wanted to use them later? Following from the sequence of events in the trailer I consider it much more likely that this is a hangar inside the massive structure seen floating in space behind the Sleeper ruin. Notably, this scene shows us two male Drifters next to each other. We knew that there are at least two female Drifters – Artemis and Strategos – but so far we have only ever encountered one male – Apollo Tyrannos. That implies that there are either more male Drifters or that Apollo has many clones who coexist. In the next scene we see that the Drifters are fighting what I assume to be capsuleers over the remains of a Jove Observatory. Clearly the Drifters do not want anyone near them, and the immense power of their weapons is demonstrated as they first destroy a Kronos in Bastion Mode and then a Golem. Finally, a Circadian Seeker appears and collects a capsuleer corpse, likely to be used in the procedure to create more Drifters. At least that is strongly implied by the whole cinematic trailer. So what does this trailer tell us? First of all, the Circadian Seekers and Drifters definitely work in unison. The Drifters break open the Jove Observatories and the Seekers gather material from it. The Seekers also collect corpses, apparently to make more Drifters. The Scope recently reported on that cooperative behaviour. Speculations revolve around where they do that and how. Personally I assume that procedure takes place inside the massive mothership-like structure and they use minds from the Sleeper Construct to awaken those corpses. For the people not familiar with the details, I’ll explain. Historically, the Sleepers used to be Jove. They developed a complex virtual reality—The Construct—where they could exist as pure infomorphs as well as experiment and design new technologies. During the collapse of the second Jove Empire, the most radical faction of these VR pioneers—The Architects—proposed that everyone should completely withdraw their minds into The Construct to escape the consequences of the Jovian Disease. Not everyone agreed with them however, so they eventually split apart from the rest of the Jove and travelled beyond New Eden until they found Anoikis—Wormhole Space. For a long time they existed there in space borne enclaves protected by powerful defense drones until some unknown fate befell their civilisation. The theory is, however, that they still exist inside the virtual reality even if their bodies might be dead. The main questions which arise from the trailer are: whose mothership is this, where does it come from, which minds are implanted into the collected corpses and to what purpose? What we can see of the ship’s exterior looks unfamiliar, but if the hangar is inside that ship then it is most likely of ancient Jovian origin. In their history, the Jove have used gigantic colony vessels to travel to new solar systems. Some of them must have been used during the exodus of the Architects to Anoikis. It is surprising that we have never seen one before, but they might have been deconstructed and recycled to build the Sleeper space colonies. It may also be that the last of those ships remained hidden in a region which has never been opened up to conventional exploration. Today we see the appearance of new wormhole connections to Thera and the shattered systems, but also the as-of-yet completely unknown location of where the Drifters come from. The supernova of Caroline’s Star was part of a cataclysmic event that opened those new connections, just like the Seyllin Incident opened connections to Anoikis. The Sisters of EVE have confirmed that speculation. Looking at the wormholes used by the Drifters, an explorer can see through to the other side, and the stellar backdrop looks similar to Thera, which suggests that the Drifter’s origin may be close to that system. This allows the conclusion that whoever flies the mothership and creates the Drifters makes use of those new interstellar pathways. The voiceover of the trailer proposes that it may be the Sleepers themselves, so maybe they have found a way to establish communications from the Construct to their ancient colony vessels and control them remotely. An even more conjectural theory which I personally support involves the enigmatic Talocan civilisation. These interstellar nomads that possessed advanced space-time manipulation technology had reached Anoikis before the Sleepers, and when the latter arrived, both races coexisted for some time until the Talocan seemingly disappeared. Evidence lends itself to the conclusion that they were devastated by a pandemic. Originally, the Sleepers had Jove caretakers—a faction called the Enheduanni who have since gone underground—but most of them were left behind when the Architects emigrated from New Eden. The Talocan might have become their new caretakers and as such could have become the crews of the ancient colony ships too. Potentially, they may have taken some of those ships onto further excursions to finally return now, decades or even centuries later, only to find their original settlements ravaged and plundered by New Eden’s capsuleers and empires. The Sleeper enclave in the trailer appears to be completely destroyed. Normally, Sleeper structures in Anoikis appear abandoned, even derelict, but not devastated like this one. 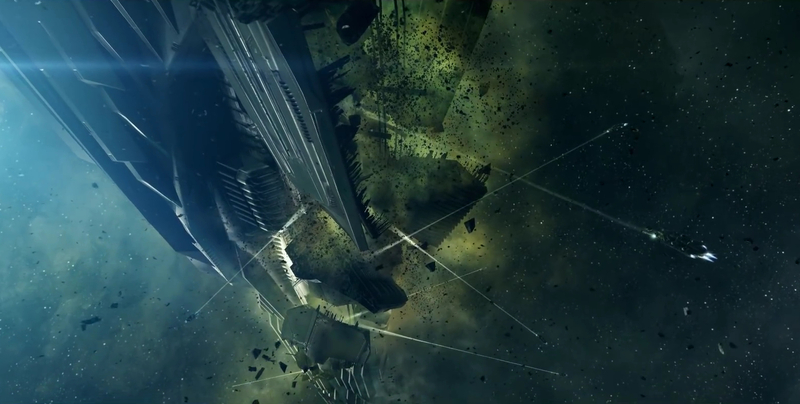 If we look at the evidence that the Drifter wormholes lead to Shattered Worlds however, it is entirely possible that some Sleeper bases have been destroyed when the blast of Caroline’s Star supernova propagated through the interstellar pathways it opened. No matter whether the crew of the mothership are Sleepers themselves or Talocan who served them, they would both see the need to recreate bodies for the wayward Sleeper minds to inhabit, because the ancient rule of The Construct was that every mind inside must be represented by a body outside. The voiceover of the trailer supports the theory that we are witnessing Sleepers who are reviving their own corpses which died over the course of time, during the supernova event, or when they were plundered by the empires for Clone Soldier implants. That would imply the Sleepers have constructed the Circadian Seeker drones and those new Drifter battleships for retribution against the capsuleers, or whoever else caused the explosion of Caroline’s Star. If we are indeed seeing Sleeper or even Talocan activity here, then it is highly unlikely that they would have caused that explosion deliberately since it clearly destroyed at least some of their own stations. There are more disturbing theories though. In the recent history of The Construct, artificial minds have emerged from the virtual reality. In the lore they are called The Other. For the Sleepers it was unacceptable to have minds without bodies present in The Construct, and it is strongly implied that there was a conflict in the VR realm during which the Sleepers lost and are now prisoners in their own virtual world. Several years ago, one of those emergent minds has insinuated itself into the datastream during the burnscanner mind-transfer of Jamyl Sarum and now possesses the Amarr Empress, partially controlling her actions. The remaining minds may have a similar desire to occupy a body. Since they were born within a society which requires them to have one, they would very likely consider a body as prerequisite for a complete existence. Even if that is not their motivation, they may simply crave the expansion of their experience by gaining physical form. In that case, they would actually have a motive to cause the explosion of Caroline’s Star to create enough Sleeper corpses for them to inhabit, and at the same time disconnect the remnants of the Jove Empire because they would likely consider the Jove progenitors of the Sleepers a potential threat. An even more speculative theory is presented by Jovian Labs member Uriel Paradisi Anteovnuecci. He suggests that The Other are not artificial intelligences which emerged from a sufficiently advanced machine network, but the minds of the Tyrants from the Second Jove Empire. According to him, the Tyrants insinuated themselves into The Construct when their power faded to wait for a time when they could reclaim it. I have discussed this theory before and there is indeed much that can be said for it. In particular it would explain why the Drifters and their Circadian Seeker servants are familiar with ancient Jove structures like the Observatories. It would also provide them with a motive to cause the supernova, similar to what I outlined above. My main problem with that theory—as I have said previously—is the passage of time. Why would the Tyrants wait so long to return after their minds have been carried far beyond New Eden with the Sleepers? Historically, the time after the Second Empire’s collapse would have been a much more suitable moment to seize power with the Sleepers leaving, the Enheduanni vanishing into obscurity, and the Directorate weakened by the Jovian Disease. In a different interpretation of that theory, Rhavas suggests that The Other may have assumed the role of the Tyrants of old which they would be familiar with from the historical records of the Sleepers. Potentially they would follow that historical precedent of rulers who subjugated and united all Jove factions. It is a thought that had crossed my mind as well, and I very much appreciate that Rhavas contributed here to remind me of that. At the end of it all, despite the revelations the trailer provides, there are still many more enigmas to solve. Apart from the questions I have already addressed, we have to wonder about the nature and purpose of the Antikythera Element—a component the Drifters and Circadian Seekers extract from the Jove Observatories. Clearly we are living in interesting times which offer new potential for explorers and lore researchers, but also players looking for challenging PVE experiences and by extension those who hunt them for their own profit.